When human/nature dualisms are identified and moved aside, ontologically basic relations come to contain both material and more-than-material features. Both posthumanist relationality such as Karen Barad’s, and that which is characterized by Aristotle as being inferior to primary and precedent, metaphysically isolated “substances,” should be rejected. Both position either “relations” or “substances” as primary, when both relations and substances should be taken as primary and wholly, mutually interdependent. In this context, Selves and the relations between them are ontologically basic, just as they are in Noddings’ interhuman care ethics. Part of the underpinning for positioning Selves and their relations thusly also rests in rejecting theories of relations that must always begin with brute material proximity and progress to closer forms. 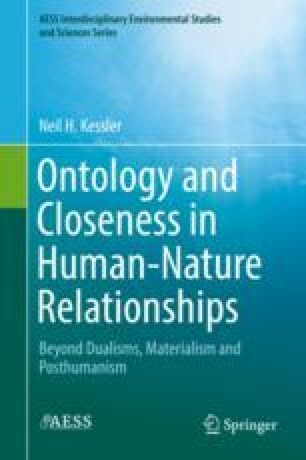 With such human/nature dualist assumptions removed, ontologically basic and irreducible close human-nature relationships can exist between relational Selves.